Is ocean acidification — the reduction in the natural alkalinity of the oceans due to the elevated absorption by the oceans of CO2 released into the atmosphere from the burning of fossil fuels — having an adverse impact on marine plankton Plankton is a generic term for a wide variety of the smallest yet most important organisms form that drift in our oceans. They can exist in larger forms of more than 20cm as the larval forms of jellyfish, squid, starfish, sea urchins, etc. and can be algae, bacterial or even viral down to as small as 0.2µm. They are nutrient and light dependent, and form the essential foodchain baseline for larger dependent aquatic lifeforms. Fish species rely on the density and distribution of zooplankton Zooplankton form the group of tiny animals such as minuscule jellyfish and rotifers present in the marine environment. They are a major source of food for those higher up the food chain, and their numbers relate directly as a good indicator to the nutrient enrichment of the sea of the area. Note: phytoplankton are microscopic plants, and zooplankton are microscopic animals. to coincide with first-feeding larvae for good survival of their larvae, which can otherwise starve. Man-made impacts such as dredging, dams on rivers, waste dumping, etc can severely affect zooplankton Zooplankton form the group of tiny animals such as minuscule jellyfish and rotifers present in the marine environment. They are a major source of food for those higher up the food chain, and their numbers relate directly as a good indicator to the nutrient enrichment of the sea of the area. Note: phytoplankton are microscopic plants, and zooplankton are microscopic animals. density and distribution, which can in turn strongly affect larval survival and thus breeding success and stock strength of fish species and the entire ecosystem. They also form the essential basis of CO2 take up in our seas ecosystem, hence Global Warming. worldwide, and thus causing a planetary emergency? CO2 absorption is changing the chemical composition of sea water. 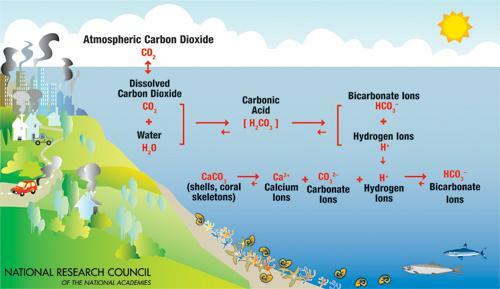 Put simply, when CO2 is absorbed by sea water it forms carbonic acid, and when elevated levels of CO2 are absorbed and generate elevated (above normal) levels of carbonic acid, this is reducing the availability of calcium carbonates in the water column [see diagram below]. Calcium carbonates or CaCO3 (which we experience as limestone, chalk and marble in the terrestrial world) are the chemical compounds essential for the formation of sea shells and marine skeletons. Nearly all sea life, from fish and shellfish to phytoplanktonMicroscopic marine plants, usually algae. These microscopic plants are at the base of the food chain, and are the food of zooplankton Zooplankton form the group of tiny animals such as minuscule jellyfish and rotifers present in the marine environment. They are a major source of food for those higher up the food chain, and their numbers relate directly as a good indicator to the nutrient enrichment of the sea of the area. Note: phytoplankton are microscopic plants, and zooplankton are microscopic animals. (microscopic marine animals). Note: phytoplankton are microscopic plants, and zooplankton Zooplankton form the group of tiny animals such as minuscule jellyfish and rotifers present in the marine environment. They are a major source of food for those higher up the food chain, and their numbers relate directly as a good indicator to the nutrient enrichment of the sea of the area. Note: phytoplankton are microscopic plants, and zooplankton are microscopic animals. are microscopic animals. (tiny marine plants) and zooplankton Zooplankton form the group of tiny animals such as minuscule jellyfish and rotifers present in the marine environment. They are a major source of food for those higher up the food chain, and their numbers relate directly as a good indicator to the nutrient enrichment of the sea of the area. Note: phytoplankton are microscopic plants, and zooplankton are microscopic animals. (tiny marine animals) have a skeletal structure. Skeletal structures generally require calcium carbonates, and if the availability of these carbonates is reduced due to acidification then sea life cannot form adequate skeletons, and dies. There is evidence that this is happening at the present time. Acidity/alkalinity is measured on a logarithmic scale from 0 to 14 (units pH), where below 7 is acidic and above 7 is alkaline. 7 on the pH scale is therefore neutral e.g. pure water (neither acidic nor alkaline). In understanding how the logarithmic scale operates and calculates acidity/alkalinity in sea water, it is essential to realise that because the pH scale is logarithmic each whole pH value below 7 is ten times more acidic than the next higher value. For example, pH 4 is ten times more acidic than pH 5 and 100 times (10 times 10) more acidic than pH 6. The same holds true for pH values above 7, each of which is ten times more alkaline than the next lower whole value. Thus, pH 10 is ten times more alkaline than pH 9 and 100 times (10 times 10) more alkaline than pH 8. Pure water (pH 7) is neutral. It is estimated that between 1751 and 1994 surface ocean pH has decreased from approximately 8.25 to 8.14. This means that ocean pH has already decreased by about 30% and, if we continue emitting CO2 at the same rate by 2100 ocean acidity will increase by about 150%, a rate that has not been experienced for at least 400,000 years. Such a monumental alteration in basic ocean chemistry is likely to have wide implications for ocean life, and especially of course for those organisms that require calcium carbonate to build shells or skeletons. Note: For an excellent, simple and very clear explanation of ocean acidification and its processes and consequences, see the video below. Marine phytoplanktonMicroscopic marine plants, usually algae. These microscopic plants are at the base of the food chain, and are the food of zooplankton Zooplankton form the group of tiny animals such as minuscule jellyfish and rotifers present in the marine environment. They are a major source of food for those higher up the food chain, and their numbers relate directly as a good indicator to the nutrient enrichment of the sea of the area. Note: phytoplankton are microscopic plants, and zooplankton are microscopic animals. (microscopic marine animals). Note: phytoplankton are microscopic plants, and zooplankton Zooplankton form the group of tiny animals such as minuscule jellyfish and rotifers present in the marine environment. They are a major source of food for those higher up the food chain, and their numbers relate directly as a good indicator to the nutrient enrichment of the sea of the area. Note: phytoplankton are microscopic plants, and zooplankton are microscopic animals. are microscopic animals. are present throughout the ocean. They are a key part of the marine food chain, and they also display a central role in another vital planetary ecological system. They recycle and re-generate around 50% of the planet’s oxygen. However, marine scientists estimate that marine phytoplanktonMicroscopic marine plants, usually algae. These microscopic plants are at the base of the food chain, and are the food of zooplankton Zooplankton form the group of tiny animals such as minuscule jellyfish and rotifers present in the marine environment. They are a major source of food for those higher up the food chain, and their numbers relate directly as a good indicator to the nutrient enrichment of the sea of the area. Note: phytoplankton are microscopic plants, and zooplankton are microscopic animals. (microscopic marine animals). Note: phytoplankton are microscopic plants, and zooplankton Zooplankton form the group of tiny animals such as minuscule jellyfish and rotifers present in the marine environment. They are a major source of food for those higher up the food chain, and their numbers relate directly as a good indicator to the nutrient enrichment of the sea of the area. Note: phytoplankton are microscopic plants, and zooplankton are microscopic animals. are microscopic animals. levels worldwide have fallen by up to 40% over the last 50 years. If this fact — the decline in marine phytoplanktonMicroscopic marine plants, usually algae. These microscopic plants are at the base of the food chain, and are the food of zooplankton Zooplankton form the group of tiny animals such as minuscule jellyfish and rotifers present in the marine environment. They are a major source of food for those higher up the food chain, and their numbers relate directly as a good indicator to the nutrient enrichment of the sea of the area. Note: phytoplankton are microscopic plants, and zooplankton are microscopic animals. (microscopic marine animals). Note: phytoplankton are microscopic plants, and zooplankton Zooplankton form the group of tiny animals such as minuscule jellyfish and rotifers present in the marine environment. They are a major source of food for those higher up the food chain, and their numbers relate directly as a good indicator to the nutrient enrichment of the sea of the area. Note: phytoplankton are microscopic plants, and zooplankton are microscopic animals. are microscopic animals. populations — is confirmed as being both widespread, and as significant in scale and also as sustained as is currently believed, it would not just impact seriously on the marine food chain. It would also result in a reduction in the recycling of CO2 back into the atmosphere as oxygen, and interfere with climatic conditions and cloud formation. Is this scenario real? 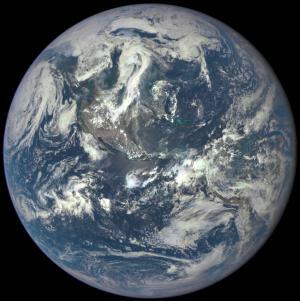 Assuming it is, the important question is : does it constitute the beginning of a planetary emergency — the only cure for which would be the rapid and permanent reduction in the burning of fossil fuels? This Marinet Special has this question in the forefront of its concern, and we present here the following articles and sources of information to enable you to explore the issues further. This University of California film explains why ocean acidification, caused by CO2 released into the atmosphere from fossil fuel burning, is causing a life survival crisis — in short, a planetary emergency. Titled: Ocean Acidification — Revolution World Issue, it is an in-depth look at ocean acidification with scientists Charlie Veron, Katharina Fabricius, Boris Worm and Ove Hoegh-Guldberg, narrated by Rob Stewart, Director of the film Revolution. Video length, 9 minutes. This University of California film provides, in cartoon format, a very clear and very easily understood explanation of ocean acidification and its consequences. Titled: What is Ocean Acidification? Demystifying ocean acidification and biodiversityBiological diversity in an environment as indicated by numbers of different species of plants and animals. impacts, the film explains why the oceans are becoming more acidic, and how this threatens biodiversityBiological diversity in an environment as indicated by numbers of different species of plants and animals.. Video length: 12 minutes. See how Marinet believes we can change the ocean governance of the oceans and their management via this link to Conserving the Great Blue, written by Marinet Member, Deborah Wright.